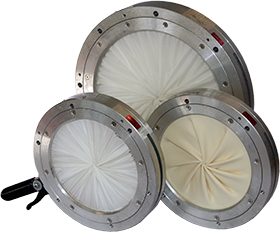 Mucon Iris Diaphragm Valve (IDV) utilizes a concentrically closing fabric or rubber diaphragm to accurately control the flow of powders and granular material. 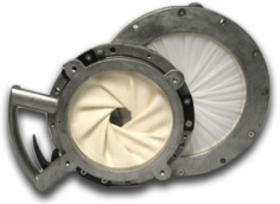 Ideal for “trickle-feed” applications and shutting off against a flow of material. 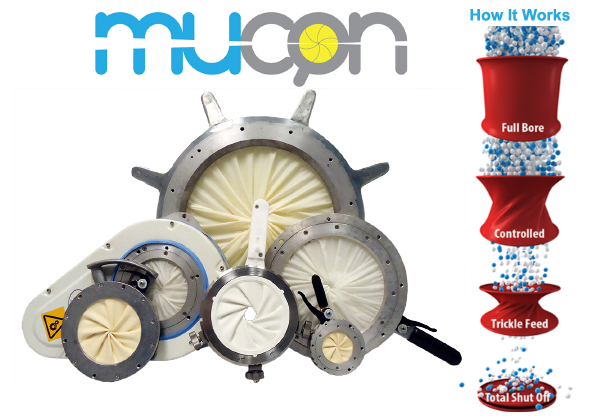 Mucon has a range of 6 different models, each in a large range of sizes to meet the needs of virtually all powder flow applications. ++ Viton Coated Terylene is ok for 200ºC. Select most appropriate material using the diaphragm selection guide. 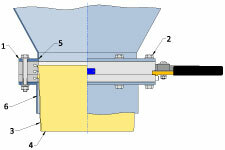 The diagram shows the ideal way in which a Mucon Iris Diaphragm Valve should be installed. If the recommendations are followed, a prolonged diaphragm life will result. The AD, JS & K series of valves have lever slots, which allow the control levers to move through 180°. Accordingly installation requires a combination of through bolts and set screws to be used. 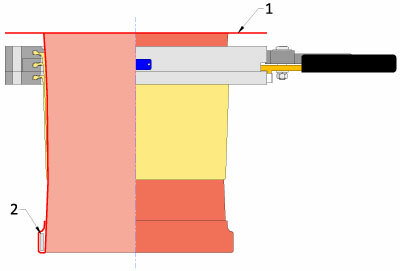 If there is any misalignment of the ductwork connected to the valve, this can cause the lever slot to open or close. With a serious misalignment the valve body will be under stress, which could lead to rapid wear taking place and the failure of certain components. All valves are fitted with a label indicating the directions of material flow. Flanges must be flat and free from distortion. Fixing bolt over and under lever slot must not protrude into the slot. For diaphragm length see inside brochure. 12mm clearance from base of open diaphragm. Inlet diaphragm 5mm smaller than inlet size of valve. Discharge diameter 10mm larger than outlet size of valve. Acting as a hygienic and protective liner. Liners can be used on their own or with an adaptor. 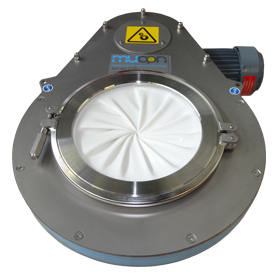 By inserting a liner through the diaphragm of the Mucon Iris Valve, you can isolate the valve components such as the body, clamp ring and diaphragm from the flow of potentially harmful or dangerous powders. Lining the iris valve with a liner produces smooth powder contact surfaces resulting in a more hygienic and easier to clean assembly. This arrangement is especially good in Food, Pharmaceutical and other applications where powder hold-up is not desired. 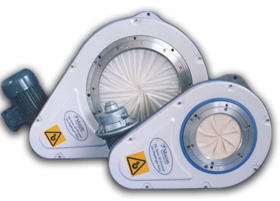 Lining of the iris valve to protect the valve components from potentially harmful and corrosive powders. Where a fabric diaphragm is specified, it is always necessary to have a certain weight of material acting downwards to make it open fully. If the material has a tendency to bridge, often the diaphragm will only partially open. The load exerted by the product forces the various layers of diaphragm material tightly together and when the control lever is operated, these try to rotate against each other. It has been observed that when a Mucon Iris Diaphragm Valve operates, the material in the column adjacent to the top face of the valve tries to turn as the valve is opened. Both of these problems can be eliminated by the use of a liner. Number of operations per day. Amount of material passed per day. The abrasiveness of the material. In our experience the life of a diaphragm can vary between a few months and many years. Where the life can be measured in months it is often beneficial to consider the use of a liner. The most frequently used liner material for combating abrasion is LINATEX rubber. This is a natural rubber with a better resistance to abrasion than steel. 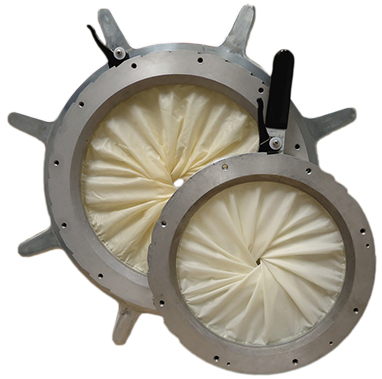 Where this is used it is important that a fabric diaphragm is used in the valve. 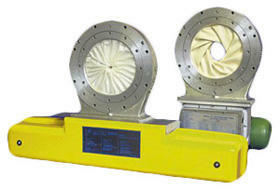 For in-line applications a double flange liner can be used.